Help Deserving Students Achieve Higher Education. A Step Up To Achieve Inc.
A Step Up To Achieve Inc. is an approved 501(c)(3) public charity focused on academically high performing high school students from lower-income families who, due to personal circumstances, may initially choose to not pursue educational opportunities beyond high school but strongly demonstrate the skills and determination to succeed in college. Our goal is to bring together candidates and eventually sponsored students with one or more of our Founders who are skilled in preparing students and their families for the college application and admissions process – and individual and corporate donors who fund our scholarships and may provide summer jobs and college internships. Our involvement with candidates will begin at the end of their sophomore year in high school. From that point, sponsored students will be selected and we will provide our Financial Services and Support Services through completion of acceptance and admission to the sponsored students’ college of choice. During our sponsored students’ college program, we will maintain two-way communications and offer advice that our Founders are uniquely qualified to provide. In 2016, our plan is to begin with one pilot high school in central New Jersey. During our start-up year, we will improve our processes and delivery capabilities and then determine if we can expand to include other high schools. Individual and corporate donations will be critical to our continuing role. So too will be our ability to establish effective interfaces with colleges and universities that may be “target list” schools for our Sponsored Students. We will also seek state and federal grants that may be available to our 501(c)(3) organization. I wasn’t sure if I would get the chance to attend college.  A Step Up to Achieve gave me the support I needed to go and now my future is unlimited..
Our mission will include both Financial and Support Services, providing a robust level of assistance that will motivate sponsored students to set high goals and confidently pursue a plan for admission to college.